Jon Randall wrote: Looks good Colin. Thanks Jon. 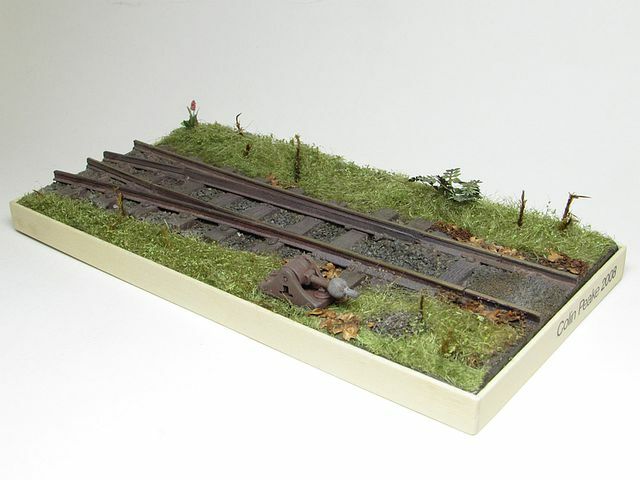 To be fair the planked wagon is a few inches behind the layout! But does remind me, I need to get some pics of the wagons as they now stand! 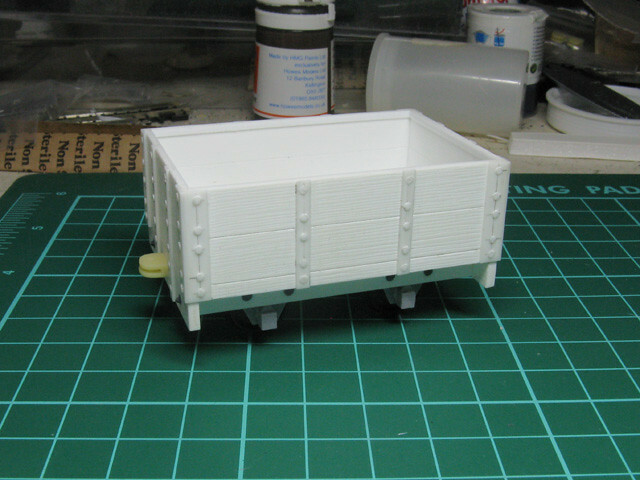 Colin Peake wrote: I have mocked up the grounded van body based on dimensions of a 4mm scale model, hopefully this will sit OK size wise with the existing builing - haven't had the two sections back together yet! Surely it would be easier to work from a 4mm scale drawing which I'm sure you must have one around to photocopy and enlarge. If not, give me a shout, I'm sure I could find one. Colin I really like the way you are able to create a sense of scale with such small modules. It allows one to concentrate on a lot of great detail in a small space then move on to the next module. I like the idea of the feeling that a piece can be both finished and yet not at the same time. Steve Bennett wrote: Surely it would be easier to work from a 4mm scale drawing which I'm sure you must have one around to photocopy and enlarge. If not, give me a shout, I'm sure I could find one. 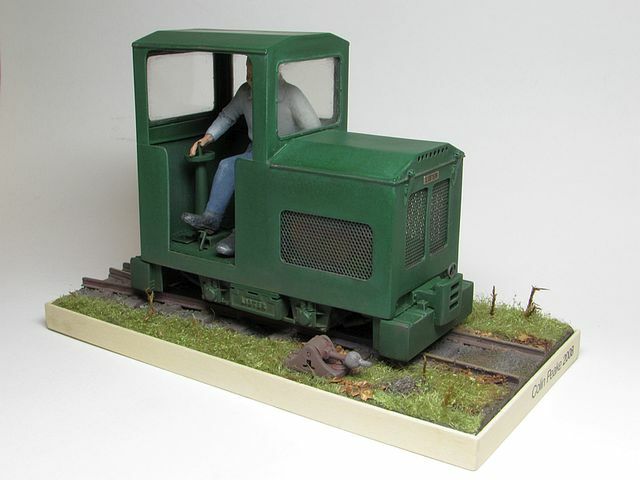 Would you belive it if I said that it was quicker to measure the 4mm scale van that was on the workbench than get up and seek out a drawing?! Of course I then had to get up and find a calculator.... The cereal packet card mock-up will be replaced in due course with a proper model, likely to incorporate some more balsa or perhaps some basswood. Thanks to all for their comments on the extension so far! As promised, some pictures of the weagons for Ambassador Works in a state closer to completion. 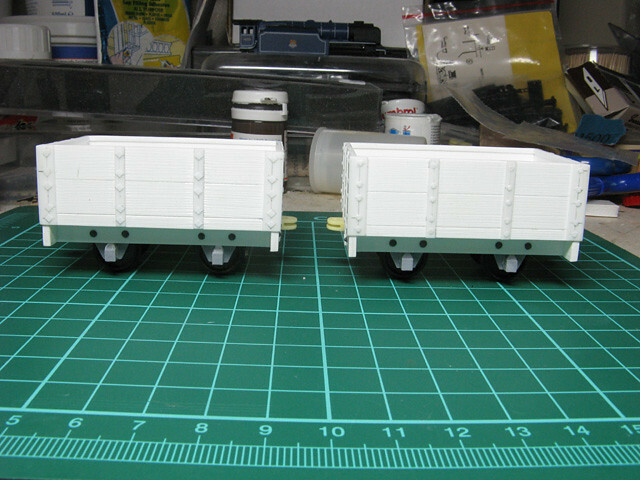 Just to ring the changes the two open wagons have differing fastenings! Very nice Colin, I like the proportions. Is that a steel rim that you have depicted around the top of the opens? More craftsman modelling from Mr. Sandshifter. Fantastic - just prototypical enough to carry the "look" - yet just caricatured enough to be endearingly appealing. Steve Bennett wrote: Very nice Colin, I like the proportions. Thanks to Ian and Andi for your comments! Your plastic work is stunning. As always. 1). 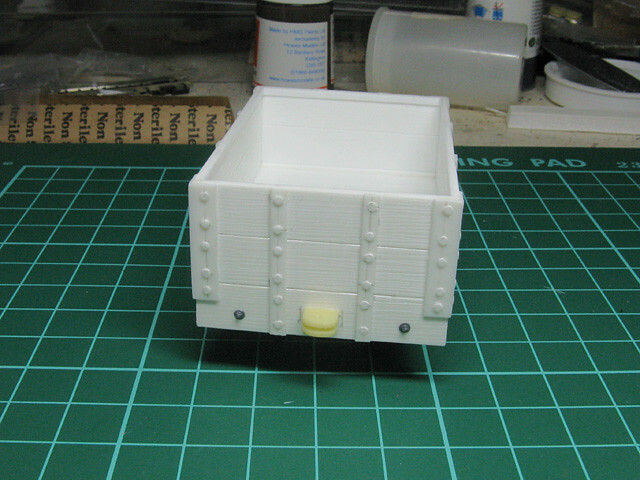 How do you get the wood grain into the plastic? Was it a file/rasp? 2). How do you make the little round rivet heads in the strapping. Are they cut out of another piece of plastic and glued on the top? They don't look like they have been stamped in. I have to go with Glen,how did you make the great looking Rivets? They look fantastic as does the rest of your pike.Been following it and love the simplicity and care of detail you you create,thank you. 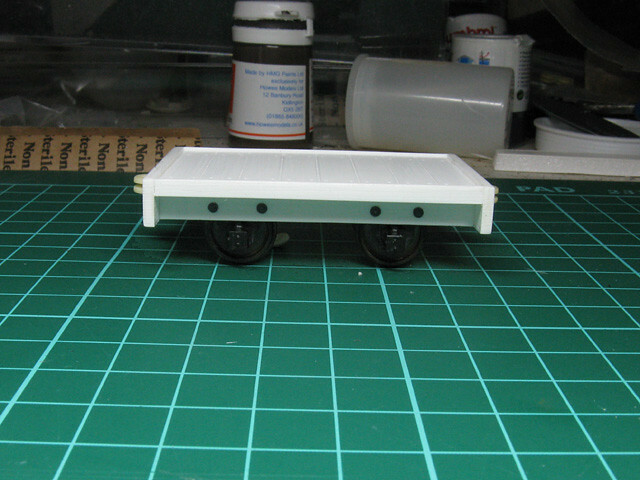 Really sharp clean work on the wagons Colin, I am also curious about the rivet fastenings. Right, time to explain myself! The wood grain was individually scribed onto each part, some, such as the inner sides and floor before assembly, others afterwards (but before adding strapping). I simply used the tip of my Swann Morton straight blade to scribe into the styrene, then a curved blade to carefully de-chaff the lines. Two methods were employed for the fastenings. The round ones are slices of evergreen rod carefully glued into marked positions on the strips, then after being left to dry overnight sanded down to a common thickness (I can't slice that well!). The diamond sections were 10 x 60 thou strip cut to 1.5 mm lengths and added into marked positions as before. Steve tells me he usesthe other method for this too, but using square section! I know you said you used corrugated card for the building finish, is this a inner and outer skin of a suitable cardboard box seperated? Thanks for your comments, I sold on Ambassador Works some time ago and I believe it is about to change hands again - I'll be interested to see how the new owner develops it. Do let us all know how your project turns out. Hi Colin, I've just read the whole thread and I think you've done an excellent job with your layout and can't wait wait for more!! 14 & can't decide on a trackplan. Hi Colin again, what pack size Ferrero Rocher box was it?? I’ve reposted one of Colin’s photos of the Ambassador Works layout unfinished but in its final configuration of 3 modules, each about 300 mm long. Most of this thread is about the module at the far end. Luckily I had almost all the pictures in low-res format and was able to recreate a couple that I didn't have, frustratingly four images appear to be lost forever, even the full res ones are not saved where they should be. Luckily two have been found in very low-res form and have been included in the relevant post. Many thanks for that Colin. chris stockdale wrote: Many thanks for that Colin. That is unlikely unless I come across another cache of my low res images, which I suspect that I won't as they appear to have been missed from my back-ups on the basis I could re-create them if required... I just didn't envisage doing it in any quantity!